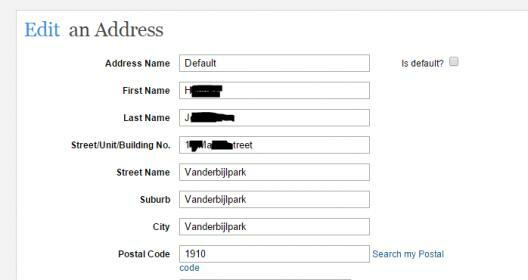 These users you mention have all put those details in the address fields to make up his address. I will look into it a bit further to see what we can do. Leaving part of my sender address out too. Something is wrong on Bob. 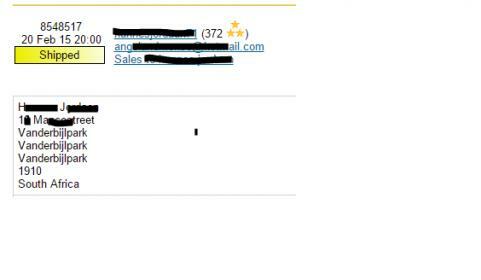 I have sent these buyers orders in the past and this was not like that before. Agreed, there seems to be a problem! Addresses are being duplicated and some being left out on print screen. I print more than 2000 shipping labels monthly. I phoned Bidorbuy about this. I was informed that there is NO PROBLEM, and it is a result of buyers not completing their addresses correctly. I see many problems with this, because I have to manually fix Shipping Labels and Picking Slips, and I already made a mistake or two! In Firefox I cannot open shipping lables, the label just flashes on the screen then disappears. I have to make the shipping lables manually. We have received a number of calls, mails and posts around this issue and I hope that this will give you guys some idea of what we are all dealing with at the moment. This is currently your view when you see an order come in and I am sure when you see this you are thinking that there must be a bug or something. The information that you are seeing is user generated as they have to type in where they live and where they want the item to be delivered to. And they do that on the below form and we then show that to you. We are looking at a way to make this better but it is a real pain for all involved and in the main for our sellers. But it is a very difficult (risky) thing to just override the address that user actually writes down. Currently the format that we are using is one that is seen as best practise especially when you speak to couriers who have to do physical address deliveries. And with the next round of Postal Strikes looming this is something that is becoming more and more relevant. As more and more sellers are moving away from the Postal Services and onto couriers. We are looking for a way around this and we will keep you posted on new developments.